Orlanthi culture. Bronze Age/early Iron Age mixed agrarian-pastoralists. They are the most popular player culture. They are a heroic Bronze Age culture, organized by clan and tribe into (usually) short-lived kingdoms. They tattoo themselves with magical markings to symbolize their gods, their tribe, their status, etc. In general, most Orlanthi cultures can be compared to a mish-mash of Late Bronze Age, early Iron Age historical cultures. Combine heroic Mycenaean Greeks with Hallstatt Celts and pre-Roman Italians, and add some Hittite influences and some bits from the Rig-Veda, and add some flying, thunder and lightning wielding, warrior-magicians and you won’t be far off. They worship a pantheon of gods headed by Orlanth the Storm King and Ernalda the Earth Queen. A depiction of some Orlanthi during a fertility festival. The Orlanthi are a Bronze and early Iron Age people who practice a mixture of agriculture and pastoralism, herding cattle and sheep with the assistance of dog-sized felines called alynxes. They are sophisticated crafters and are highly regarded as bronze-smiths, weavers, and potters with a distinctive and highly ornate style. Their society is based around clans of between 500 to 2000 people headed by a petty king who is aided by a council of priests, warriors, lawspeakers, and other specialists. Their culture is heroic and vengeful, placing a premium on bravery, generosity, and honor; the first of their sacred laws is “No One Can Make You Do Anything”, their second is that “There is Always Another Way”. They worship a pantheon of gods headed by Orlanth the Storm King and Ernalda the Earth Queen. A depiction of the Orlanthi gods from Whitewall. The basic arms of the Orlanthi are a bronze-tipped spear, bronze axe and a shield, to which the wealthy might add a sword, a helmet, and bronze armor. Bows, javelins, and slings are common missile weapons. Orlanthi swords are normally long and leaf-shaped, equally suited for thrusting or cutting. Long slashing swords are popular amongst horsemen. Well-made swords are intricately decorated and often given names. Metal armor is rare and very valuable. Coats of bronze scales or chain mail are worn by chiefs and thanes, as are cuirasses of bronze plates. Greaves and vambraces protect the limbs. Bronze helmets come in a varied array of styles, some have cheek pieces, and guards for the nose and neck; others protect nearly the entire head with slits for the eyes and mouth. Orlanthi decorate their helmets with inlays, crests, plumes, and feathers. Some cults use special helmets with ram or bull horns to signify their gods. Example of Orlanthi weapons and armor. The Orlanthi are olive-skinned, with black, brown, or reddish hair. Both genders tattoo their bodies with magical runes of the gods, cults, ancestors, clan, tribe, and other sacred events. Each clan and tribe has its own tattoo; at initiation, new adults are marked with those signs as well as the marks of the gods and personal runes. Status, profession, and important life events are also marked with tattoos. Orlanthi tattoos can be located on many places of the body: the face, the shoulder, the arms, legs, the back, the abdomen, and so on. Fig. 1. Aggari thane. Aggar is a kingdom uniting numerous warlike tribes from rugged hill country with more civilized and sedentary lowland folk. It is a wild land of hills and ridges, cut by rivers and deep gorges, small farms, and meadows. They domesticate large cats called alynxes for hunting and companionship. The inhabitants are notorious for raiding and feuds. The people are average size for humans. Our male Aggari thane is armed and equipped very similar to the Bronze Age horsemen picture. He carries a long leaf-shaped bronze sword (equally usable for slashing and thrusting) with an ornately decorated scabbard. If the blade is out of its scabbard, various runes should be seen on the blade – Death, Air, and Movement. He wears heavy-soled leather sandals with a long lace that is winds up his leg. As leg protection, he wears elaborately decorated bronze greaves. Underneath the cuirass he wears a long wool tunic, perhaps embroidered at the edges, and a short skirt (not patterned like a Scottish kilt, but more like that depicted on this helmet http://www.flickr.com/photos/mharrsch/548417427/). He wears a fancy bronze helmet with cheek-pieces and decorated with feathers as in the Bronze Age horseman picture. He wears bracelets of gold or silver that displays his status. Many items are decorated with Gloranthan runes or stylized faces, beasts (especially dragons, bears, and rams) and so on. His arms and neck are tattooed with runes – particularly Air (signifying the Storm God), Mastery (also signifying the Storm God), and Movement (speed and violence) – as well as other symbols signifying his clan, tribe, and status as a professional warrior for his king. Feel free to make up cool looking symbolic tattoos. He is bearded, with reddish hair (I know this is B&W but what the heck) and likely scarred from battles and duels. Fig. 2. Esrolian priestess. Esrolia is a densely populated land consisting of several rich valleys and rolling hills between them. It is a warm, verdant, and civilized land whose people are ruled by matriarchal queens and worship Ernalda the Earth Goddess above all other deities. Our female Esrolian priestess serves the goddess Ernalda and is marked with her runes: Earth, Fertility, and Harmony. She should be an attractive woman of child-bearing years (early twenties). She is tattooed with those runes, as are her clothes and accoutrements. 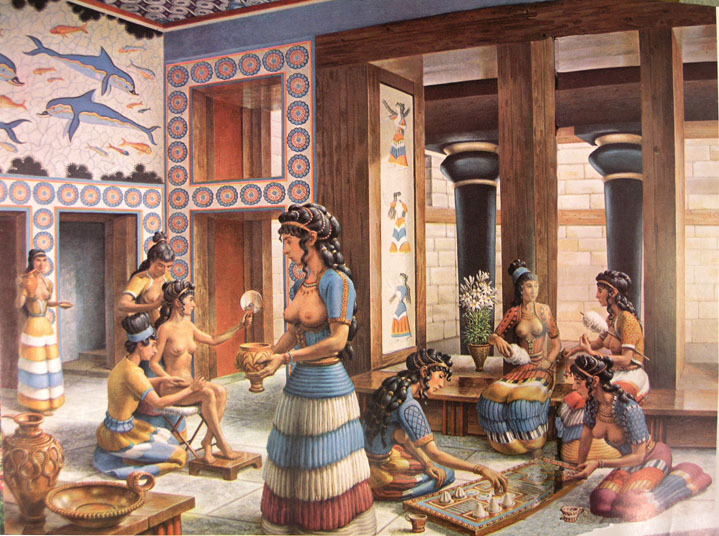 She has long brown hair that has been elaborately braided (see the Minoans in http://www.nmia.com/~jaybird/ThomasBakerPaintings/images.html/minoan_costumes/Minoan_palace_scene_enlarged.jpg) and wears an ornate headress like the Hindu Sigiriya ladies (http://commons.wikimedia.org/wiki/File:Sigiriya_ladies_01.jpg). She uses kohl to rim the eyes, paint eyebrows, darken eyelashes, and to give a “ceremonial” appearance. Please feel free to change details and add more Hindu influences – ideally something that makes one think of both Minoan Greece and ancient Hindu goddesses would be perfect! Our priestess displays her status and power with gold and silver bracelets, gold pendants, brooches, cameos, bangles, and golden earrings, all with complex patters and fine details. Most impressive is her large ornate golden necklace with emeralds. Examples include: http://farm1.static.flickr.com/29/63089422_1b2a54e531.jpg, http://en.wikipedia.org/wiki/File:Earring_Mycenae_Louvre_Bj135.jpg, http://farm3.staticflickr.com/2792/4289902094_76493d1ed6.jpg, etc.